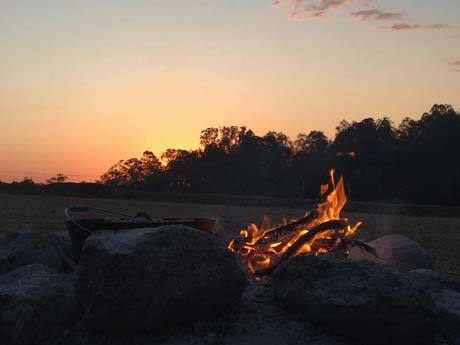 A range of bush camping experiences for family farm stays camping near Brisbane, Ipswich and the Gold Coast. Bush camping at its best! Choose from 4 different camping areas with both powered and unpowered options. Campsites are stretched out along 1.5kms of the Gap Creek that meanders its way through our beautiful property. For those going unpowered, the only rule is that you don’t block access to the powered sites and if going for a powered site we recommend bring a 20-30 metre lead – this way you are only restricted by the length of your lead. We now have 2 portable shower and toilet blocks set up in the camping area’s. 1 services Tranquility and 1 Services lakeside and gap creek. These are great little units each with 4 toilets and 3 hot showers. For those of you with small children you may find them not practical but you still have the Village Bunkhouse bathrooms available to you where there is plenty of room and always plenty of hot water. Rates include twice daily animal feeding at 8.30am and 4pm, collecting eggs and milking a cow. During your stay you can expect to do billy tea and damper, take a wagon ride and do some whip cracking and if the wind is right do some boomerang throwing.